As schools look toward the future and find new and better ways to educate students, architects and designers are working to support these initiatives during school design, construction, and renovation. The rebuild of Dunbar High School, with the help of the SCW9000 curtain wall, put many of the also forward-thinking smart school designs outlined in AIA TopicA/Design Strategies to Improve Your Children’s Schools blog post into action. 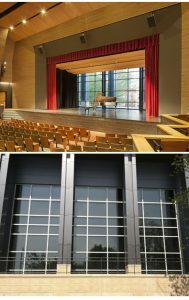 The SCW9000 acoustic curtain wall in the Dunbar High School auditorium creates a visual portal to the outside. The auditorium curtain wall provides the flow of natural light and a sound barrier for quiet creativity inside. The facility overcame the challenges of the site, to carefully engage the surrounding neighborhood through entry locations and views to connect the school and staff to the community. The curtain wall adds to the creative mixed-use, flexible learning space that can accommodate music, dance, wellness, art, physical activity, and creative learning. The rebuild of Dunbar High School, a historic institution in Washington, D.C., not only was designed to engage the students and the community, but also pay tribute to the surrounding historic urban neighborhood through windows, vistas, and inviting common spaces. Paul L. Dunbar Senior High School opened in 1870 as the first high school for African-Americans in the U.S. and has gone through several iterations before the current building. The vertical four-story design allows the building to serve 1,100 students in an urban area without sacrificing function or character. In addition to the SCW9000 acoustic curtain wall, St. 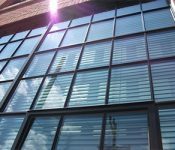 Cloud Window manufactures custom made, high-efficiency aluminum window and door products for new building construction, commercial window replacement, historic window replacement and projects where high-performance acoustic attenuation sets the standard. 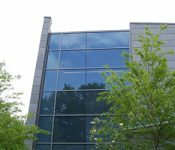 Not sure which high-efficiency windows are right for your project? View our full product line or contact us. CMMA – Central Minnesota Mfg. Assoc.